This past Monday I went shopping for my new internship as I work at a coffee shop and am always wearing a uniform. Working full-time, I’ve definitely let my style go off the deep-end… Badly. So I took all the tips I saved, some birthday money and off to Mapleview Mall I went! One of my most favourite stores to shop at is Zara. They have a whole range of different styles at different price ranges, so you do need to be careful when you’re there on a tight budget. Lucky for me, I quickly stumbled upon these two maxi skirts within 30 seconds of walking into the store, tried them on and was out of Zara within 10 minutes because one of my main needs was finding 2 or 3 maxi skirts. These two were perfect enough. 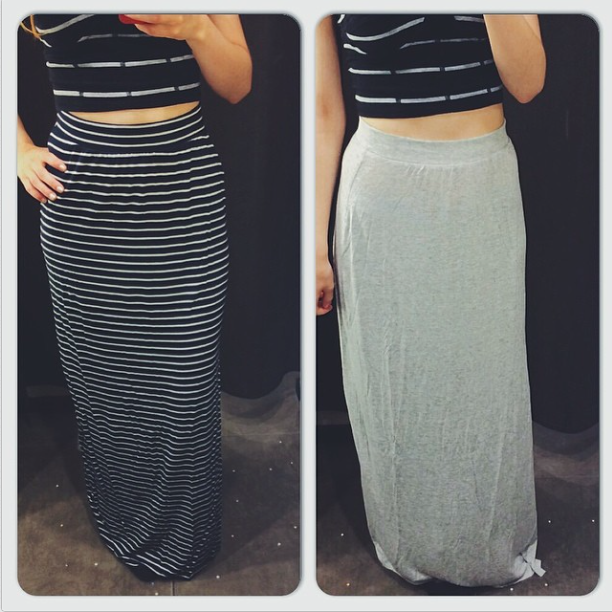 These maxis are from the ‘Trafaluc’ collection at Zara. I find that it is the most budget friendly. These two skirts were $19.90 each (Canadian). In this day in age, this is a steal! The fabric used for these skirts is absolutely perfect for the summer. To be specific, it is made out of a blend of basic synthetic fibres. 24% polyester, 71% viscose and 5% Elastane. As some of you know, polyester is known as a “warm” fabric (meaning it is supposed to keep you nice and warm). This is not the case. Since it is only 24%, it is a very little percentage compared to the viscose that it won’t even make a difference. This fabric is thin, so there is no overheating that will happen if you wear it on a really hot day. Some of you may be wondering what viscose fabric is (I sure did) and it is a man-made fabric that holds many of the same qualities that cotton holds. As I researched this fabric further, I found that it is a moisture absorbent, comfortable and breathable, making it the perfect summer fabric. The slit on the right side of the skirt also helps to create the perfect tiny breeze as you walk in the heat. Overall, these skirts are soft, comfy and versatile. You can wear it so many different ways. The crop top I am wearing is one from Garage that I bought in February 2013 to go to watch Swedish House Mafia. You can still manage to find similar styled crop tops at Garage if you’re interested (you just may not find this specific one). You can also wear it with a cropped tank top, a tank top with a distressed jean vest, or for a cool summer night, wear a long sleeved shirt with a cardigan over-top*. If you have any questions, don’t be afraid to leave a comment or e-mail me! Here is a link to the skirts on the Zara website. *I will hopefully be making a blog post within the next 2-4 weeks with a bunch of different ways to wear different pieces. So I apologize for not being able to have it up on this post right now! Next Post Days Off Look.